"Sun Shops is like my second family"
"Best jobs in Santa Cruz!" Almost every one of our locations, both on and off the Boardwalk, has a classic Santa Cruz ocean view that can't be beat! Our stores are so close to the beach that you can taste the salt from the sea, feel the sand between your toes and the ocean breeze through your hair. Guests come from far and wide to experience this magical place for one day, but join our crew and you can enjoy it every time you come to work. When the Santa Cruz summer crowds flock in, so does the business. Memorial Day through Labor Day is our busiest time of the year. Working with us during this time, you could make an easy $5,000. Think of what you can do with that kind of money. Save up for college, buy that car you've been dreaming of, go on a trip. The possibilities are endless! Sun Shops is a great place to meet new people. Our summer employment consists of about 200 people among our 17 locations. Many lifelong friendships have been built working for our company, just one of the many perks of being part of the Sun Shops team! Develop key skills like cash handling, customer service, teamwork and many other abilities that will impress future employers and help guide you into your career. Be it your first job, or a strong addition to your already shining resume, Sun Shops is the perfect stepping stone. Each year we award scholarships to two full time college students and two high school seniors, who will be full time college students in the fall. This is just one of the many ways we show our appreciation to our hardworking, dedicated staff and assist them in their pursuit of a higher education. The first step to apply with our company is to fill out an application which you can find here. Once your application is complete, you can either submit it online or stop into our main Sun Shops location on the Santa Cruz Beach Boardwalk, near the Pirate Ship ride. Please include a resume if you have one. When our hiring window is open, we will review applications/resumes and will be in contact if we are interested in setting up an interview. To check on the status of your application, call us at (831) 425-8509. 17a Municipal Wharf Santa Cruz, Ca. 125 Beach Street Santa Cruz, Ca. 601 Beach Street Santa Cruz, Ca. Sun Shops was established in 1971 by Marshall and Kathy Miller; two college sweethearts who worked at the Santa Cruz Beach Boardwalk and were given the opportunity to push around a cart and sell trinkets. That cart turned into a small shop which eventually became a bigger shop. In 1976 the couple opened Sun Shops on the Boardwalk. Today, the original Sun Shops is still in the same location and the now parent company, Sun Shops Inc., operates 17 locations throughout Santa Cruz, California. Summer jobs are some of the best times of our lives. 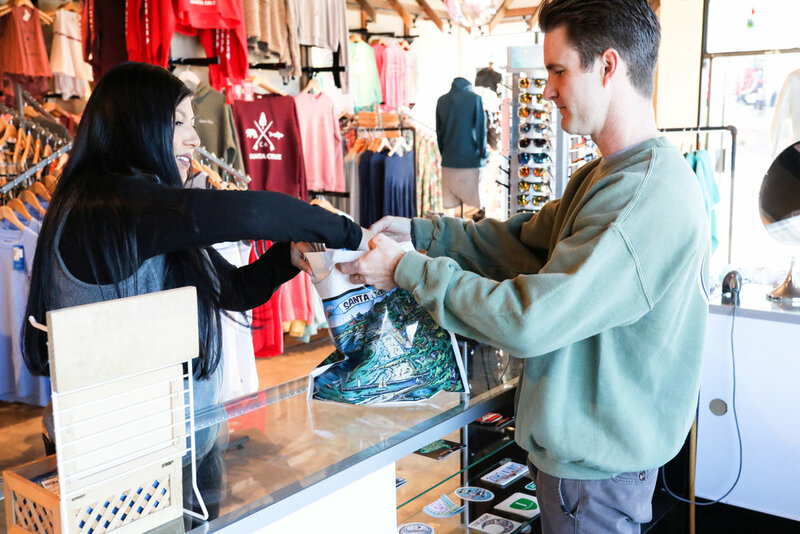 Working by the beach, building friendships and making memories to carry with you for years to come; and nobody does Santa Cruz jobs like Sun Shops. Our goal is to not only provide you with a positive, fun work environment, but an opportunity to develop skills that will be useful throughout your life and career. Join our team by clicking here to access our application. Have you worked for Sun Shops before? What are the times that you are able to be on location and at work? What was your last or current school of attendance? Please include your last two places of employment. Did someone who works for Sun Shops tell you about this job, if so what is their first and last name.